​Haymarket, VA - February 25, 2019 – Fueled by the popularity and success of their casual taco and tequila concept, Zandra’s Taqueria is proud to announce the coming Grand Opening of their new location in Haymarket. The new location, to open in summer 2019, is currently taking shape at 14600 Washington Street. The facility is a transformation from the former PACE West school to a large multi-use facility envisioned by Manassas firm Loveless Porter Architects. The restaurant will feature a large patio for outdoor dining, as well as the food and beverage selection that has made Zandra’s a local favorite. Pires continued that the style of Zandra’s is a perfect fit for the Haymarket community – relaxed dining with a menu of expertly crafted and made-to-order tacos, salads, fajitas and more. As with the Manassas and Fairfax locations, there will be a craft beer menu to satisfy any palette and an extensive selection of cocktails. To follow the development of the new Haymarket location, and be the first to know about the announcement of their Grand Opening, visit http://zandrastacos.com or follow Zandra’s on Facebook at https://www.facebook.com/zandrastacos/. Can’t wait until the Haymarket location opens this summer? Get a “preview” by visiting the original Zandra’s Taqueiria at 9114 Center Street in Manassas or the Fairfax location at 3950 University Drive Suite 210. ​ABOUT ZANDRA’S TAQUERIA: Voted Best Mexican Restaurant in Northern Virginia in 2017 and 2018 by Virginia Living Magazine, Zandra’s Taqueria is a contemporary-American restaurant offering handcrafted, gourmet tacos made with fresh, local ingredients. A lively atmosphere is complemented by popular menu items that include the Al Pastor, a taco stuffed with pork shoulder and topped with the sweet and savory combination of grilled pineapple, onion and cilantro. Tempura Shrimp Tacos are another fan favorite, with a crispy, tangy fusion of tempura shrimp and sweet chili sauce finished with house made cabbage slaw and refreshing pico de gallo. Founded in 2014, Zandra’s is also known for its community involvement, which includes clothing drives benefiting Northern Virginia Family Services/SERVE. For more information, go to www.zandrastacos.com or call 571-359-6767. You can also follow @zandrastacos on Facebook, Twitter and Instagram. Image Caption: The Zandra's Taqueria team celebrating its second "Best of Virginia Win." Zandra's is bringing its hand-rolled tacos to Haymarket this summer. A big shout out to all our guests who participated in our 4th annual Warm Up the Community winter coat drive! Together from our Manassas and Fairfax locations, we collected around 45 coats and 25 winter clothing pieces for Northern Virginia Family Service. Thank you to Friends of SERVE for working with us too! Zandra’s Taqueria, a two-time winner of Virginia Living Magazine’s “Best Of Virginia” competition, is bringing its fresh take on Mexican food to Fairfax, VA this fall. The popular eatery is known for using fresh, local ingredients to create classic flavors like carne asada and carnitas, along with creative combinations such as crispy fried chicken or gyro-inspired tacos. The second location for this gourmet taco bar will be at 3950 University Drive, just a few steps away from free garage parking. Much like the original Zandra’s in Manassas, it will offer lunch and mid-day taco specials, craft cocktails made with house infusions and well-curated taps. George Mason University students can receive $1 off tacos any time of the day with valid school ID. Plans to offer live music on weekends are also underway. Zandra’s Taqueria opens daily at 11:30am. To learn more, visit ZandrasTacos.com or Facebook.com/zandrastacos. Can’t wait until the Fairfax location opens this fall? 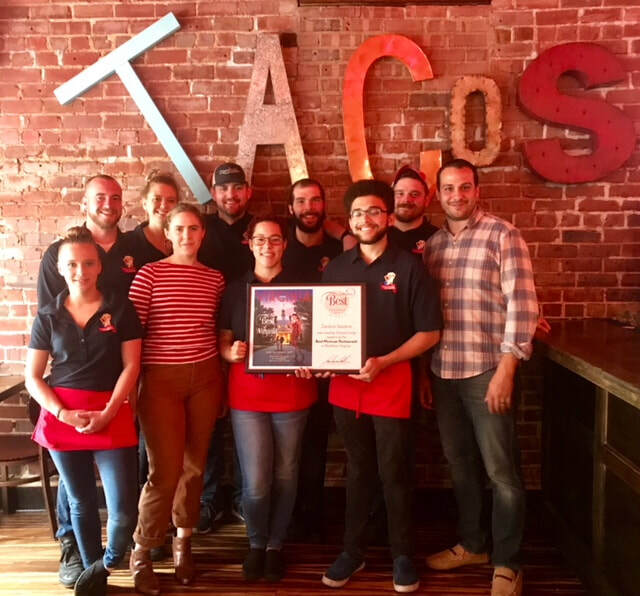 Get a “preview” by visiting the original Zandra’s at 9114 Center Street, Manassas, VA.
Photo: The Zandra's Taqueria team celebrating its second "Best of Virginia Win." Zandra's is bringing its hand-rolled tacos to Fairfax this fall, when its new location on University Boulevard opens. 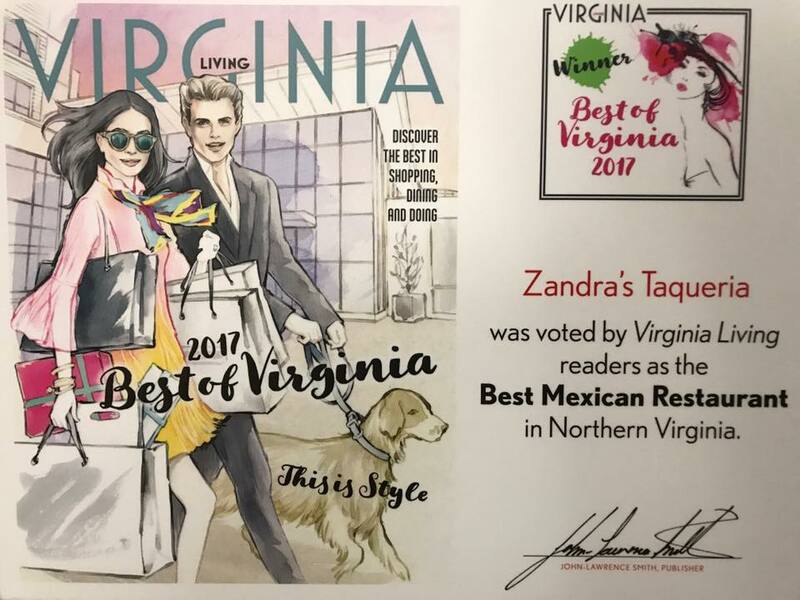 ABOUT ZANDRA’S TAQUERIA: Voted Best Mexican Restaurant in Northern Virginia in 2017 and 2018 by Virginia Living Magazine, Zandra’s Taqueria is a contemporary-American restaurant offering handcrafted, gourmet tacos made with fresh, local ingredients. A lively atmosphere is complemented by live music on the weekend. Popular menu items include the Al Pastor, a taco stuffed with pork shoulder and topped with the sweet and savory combination of grilled pineapple, onion and cilantro. Tempura Shrimp Tacos are another fan favorite, with a crispy, tangy fusion of tempura shrimp and sweet chili sauce finished with house made cabbage slaw and refreshing pico de gallo. Founded in 2014, Zandra’s is also known for its community involvement, which includes hosting annual food and clothing drives benefiting Northern Virginia Family Services/SERVE. For more information, go to www.zandrastacos.com or call 571-359-6767. You can also follow @zandrastacos on Facebook, Twitter and Instagram. We are pleased to say that this years “Warm Up The Community” coat drive was another successful donation. Every year for ​the past four years since Zandra’s Taqueria opened, We’ve worked with Friends of SERVE to help come up with donations for those in need. 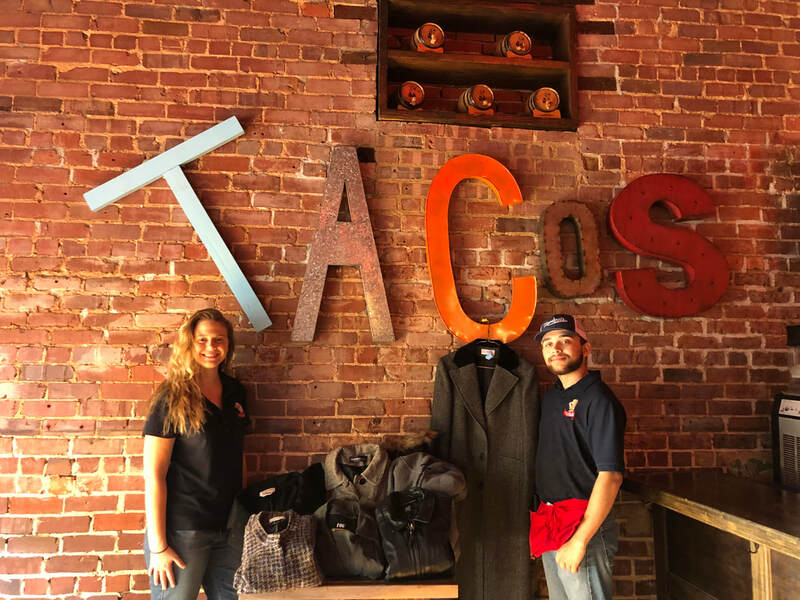 In Old Town Manassas during the Christmas Parade we take donations such as coats and any other winter items in exchange for free taco vouchers. We are happy to say that we were able to raise some money and donate 23 coats, 6 blankets, hats, scarfs, gloves, and along with other items to help those stay warm this winter. We would like to thank everyone who participated in this years Warm up the Community coat drive.